The major classical centers of carpet production in Persia were in Tabriz (1500-1550), Kashan (1525-1650), Herat (1525-1650), and Kerman (1600-1650). The majority of carpets from Tabriz have a central medallion and quartered corner medallions superimposed over a field of scrolling vine ornament, sometimes punctuated with mounted hunters, single animals, or animal combat scenes. Perhaps the most well-known of the Tabriz works are the two carpets perhaps made for the shrine at Ardabil (today in the collections of the Victoria and Albert Museum in London and the Los Angeles County Museum). 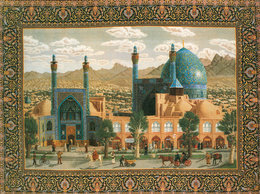 Kashan is known for its silk carpet production. Most famously, for the three silk hunting carpet masterpieces depicting mounted hunters and animal prey (currently in the collections of the Vienna Museum of Applied Arts (aka the MAK), the Museum of Fine Arts, Boston, and the Stockholm Museum). The Kashan rugs are among the most valuable in existence. One carpet, for example, is known to have been sold in Germany for $20,000 in 1969. The Herat carpets, or ones of similar design created in Lahore and Agra, India, are the most numerous in Western collections. They are characterized by a red field with scrolling vine ornament and palmettes with dark green or blue borders. The seven classes of Kerman carpet were defined by May Beattie. She identified their unique structure and named it the "vase technique." Carpet types in this group include garden carpets (ornamented with formal gardens and water channels) and the ogival lattice carpets. A fine and well-known example of the later was purchased by the Victoria and Albert Museum under the guidance of William Morris. The influence of Persian carpets is readily apparent in his carpet designs.